Tentmaker Pattern 1 [H1227] - $15.00 : Yarn Tree, Your wholesale source for cross stitch supplies. Cross stitch pattern by Carolyn Manning Designs. 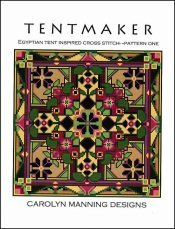 This Egyptian tent inspired design features the deep colors of purple, green & brown. As you move into the middle of the design, you will see that four quadrants have the same design until you reach the middle. Stitch count 136w x 136h.